New Liturgical Movement: Is the Medieval Liturgy a Source for the Modern Lectionary? Is the Medieval Liturgy a Source for the Modern Lectionary? This article is the fourth of a five-part series occasioned by a recent article by Dr. Kwasniewski. Click the following links to read part 1, part 2 and part 3. It is a well-known characteristic of the Missal of St. Pius V that comparatively few ferial days have their own readings, an aspect of it which many consider something of a defect. There are of course quite a few exceptions, most notably the whole of Lent, but also the Ember Days, the Rogations, and the octaves of Easter and Pentecost. Nevertheless, in the majority of the weeks of the year, if the Mass is said of the feria, the Epistle and Gospel are repeated from the preceding Sunday. This was the custom of the Medieval ordinals of the Papal court, which are the basis of the 1570 Roman Missal. Much less well known is that fact that the Use of Rome is not typical in this regard, and that most medieval Missals did in fact have a well-developed repertoire of ferial readings. They are attested in the oldest lectionaries of the Roman Rite, and present in the Missals of most important sees. Among the religious orders, however, they are found only in the Missal of the Premonstratensians. In the very oldest Roman lectionary, the “Comes Romanus” (Roman lectionary) of Wurzburg, written around 700 A.D., proper readings are assigned to the Wednesdays, Fridays and Saturdays of the weeks after Epiphany. In Eastertide, there are very few ferial readings, and they are arranged quite irregularly; in the season after Pentecost, some weeks have readings for Wednesday and Friday, others for only one of those days. In point of fact, the whole arrangement of the Wurzburg lectionary is very irregular, while the second oldest lectionary, that of Murbach, written about a century later, is set out in a much more logical and systematic way. Each week of the season per annum has readings for both Wednesday and Friday, as do the weeks between the octave of Easter and Pentecost. The Saturday readings have disappeared, except for those of major ferias like the Ember Days. This is due in all likelihood to the importance laid upon the weekly votive Mass (and Office) of the Virgin Mary, to be said on Saturday whenever there is no feast on the Calendar. This brings us to another important point about the arrangement of the lectionary. In the oldest Roman lectionaries, every feast has proper readings assigned to it, although several readings are used more than once; there are no “common” readings for any of the various groups of Saints. In a later period, those which occurred most frequently were grouped together to create what are now known as the Commons of the Saints, i.e., “generic” Masses (in the original sense of the word “generic – related to a group”) to be said on the feasts of One Martyr, Several Martyrs etc. Of course, traditionally in the Roman Rite, all of the variable parts of all Masses, whether of the season or of the Saints, are proper; the chants (Introit, Gradual etc. ), the three prayers, and the two readings, are always the chants, prayers and readings of that particular Mass. This is not less true for the fact that in both groups, the temporal and the sanctoral, there are many parts which are used on more than one occasion; nor for the fact that commemorations are often made, since they are made as additions to a wholly proper Mass, and not as substitutions for any of its parts. In the post-Tridentine period, when most churches gave up their medieval uses for that of Rome as represented by the reformed liturgical books of St. Pius V, the ferial lectionary tradition disappeared almost entirely, since they had not been in use at Rome. The revival of them in some form was occasionally discussed as part of a general project to broaden the corpus of Scriptural readings at the Mass, in much the same way as the expansion of the corpus of Prefaces was also desired by many. No one will be surprised to read that very little of the ancient ferial lectionary was revived for use in the post-Conciliar reform, since it was closely tied to a system of Sunday readings that was completely changed. Any comparison between it and the multi-year cycles of “ordinary time” would be quite meaningless. However, we may compare the older set of readings for the season of Advent to get an idea of how little it was actually used. 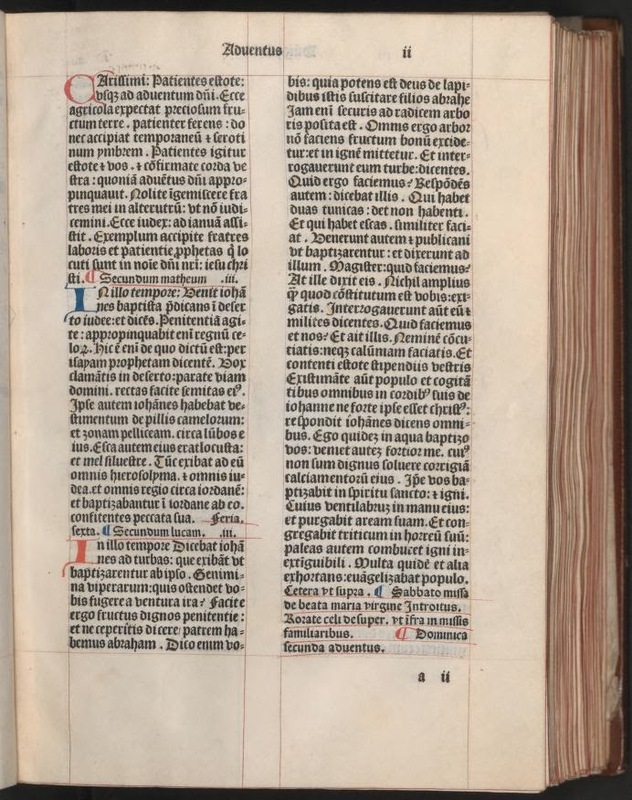 A page of a Parisian Missal printed in 1481, showing the Epistle and Gospel for the Wednesday of the First Week of Advent, and the Gospel of Friday. The medieval Use of Paris often provided two Gospels for the weekdays, but only a single Epistle. Of the 36 readings from the Old and New Testaments (excluding the Gospels) added ex novo to the post-Conciliar lectionary for Advent, two are attested on ferias of Advent in the ancient lectionaries and the plurality of medieval Missals: James 5, 7-10 and Jeremiah 23, 5-8. (The former is read on a Sunday in the Novus Ordo.) One of the most common medieval readings, Malachi 3, 1-5 and 23-24, is read in the Novus Ordo without verse 5, “And I will come to you in judgment, and will be a speedy witness against sorcerers, and adulterers, and false swearers, and them that oppress the hireling in his wages; the widows, and the fatherless: and oppress the stranger, and have not feared me, saith the Lord of hosts.” A very large number of the new readings are taken from the prophet Isaiah; this was never the case in the medieval lectionaries, since he is principally read at Matins in Advent. Of the 28 Gospels added to Advent, four and part of a fifth are attested in the ancient lectionaries; three others and part of a fourth are found in the plurality of medieval Missals. One of the most common of the medieval ferial readings, Luke 3, 7-18, has been shortened by the removal of the beginning of St. John the Baptist’s speech to the crowds, “Ye offspring of vipers, who hath shewed you to flee from the wrath to come? etc.” Almost every single medieval use of the Roman Rite apart from that of Rome itself read St. Matthew’s account of the triumphal entry of Christ into Jerusalem on Palm Sunday on the first Sunday of Advent (chap. 21, 1-9); this passage was not added to the Novus Ordo lectionary. It should also be noted that the reading of the ferial Epistles and Gospels on the feasts of the Saints constitutes a radical divergence from the historical practice of the Roman Rite. On the other hand, the repertoire of readings assigned to the Commons of the Saints has been significantly expanded in the new lectionary.